As I rushed from Tottenham Court Road station to Kanada-Ya last Friday I realised how much this part of town has changed in the last 10 years. Where once stood The Astoria lies just a big empty space . There use to be a little row of asian food restaurants around Denmark Street which were always packed, sadly most of those have now closed to make way for the Elizabeth Line . 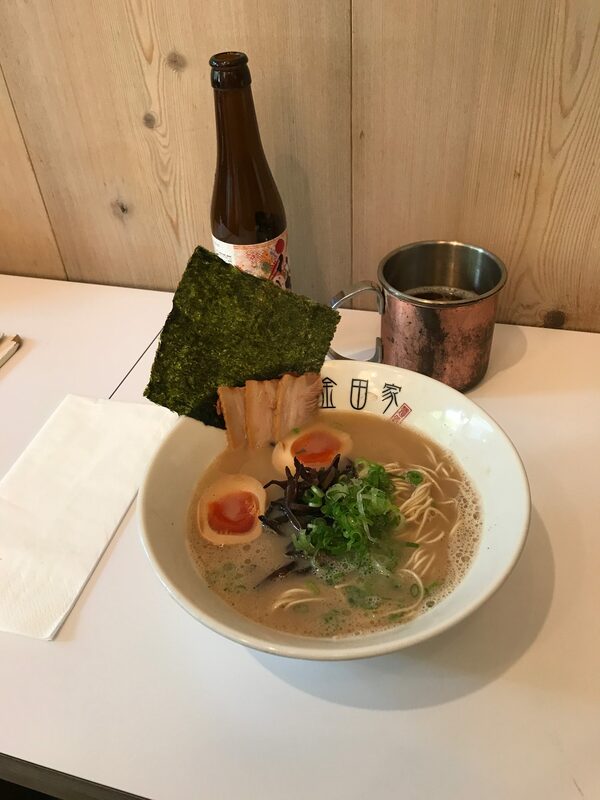 Kanada-Ya is a small restaurant just a little further towards Holborn and but having seen Giles Coren had waited outside (there’s a no-reservation system) there for a bowl of soup, I thought it was probably worth popping in. 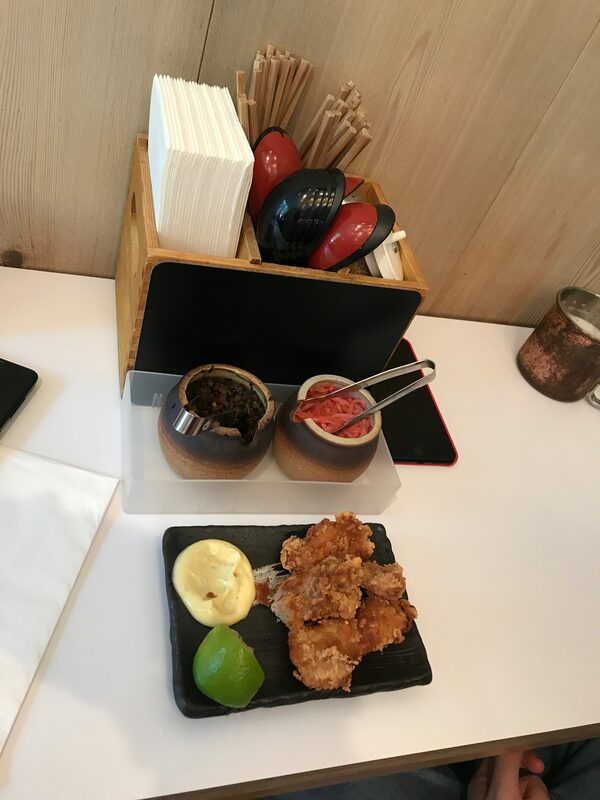 As seems to be a running theme, I was late, but having already looked at the menu online, I knew I would be choosing the karaage (because: fried chicken) and the tonkotsu x (because: exclusive to London). With unlimited access to pickled ginger, this place was already looking to be a serious contender before any food arrived! I actually forgot to take the picture before I started because I was so excited to get stuck in, hence the ‘floaters’ in the tangy yuzu mayonnaise. The chicken was juicy and crispy on the outside, but the texture was a bit weird, sort of stringy. As the server placed it down she rotated it so the logo was at the top. Having been to a traditional tea ceremony in Kyoto I know the significance they place on simple gestures such as this. The broth was alright, a bit thinner than I had expected. I re-read them menu and realised it was a combination of pork and chicken, so I assume that’s the issue. Nearly every time I’ve chosen a chicken option I’ve been disappointed. I think the lesson from this year will be that chicken-based ramen just isn’t for me. 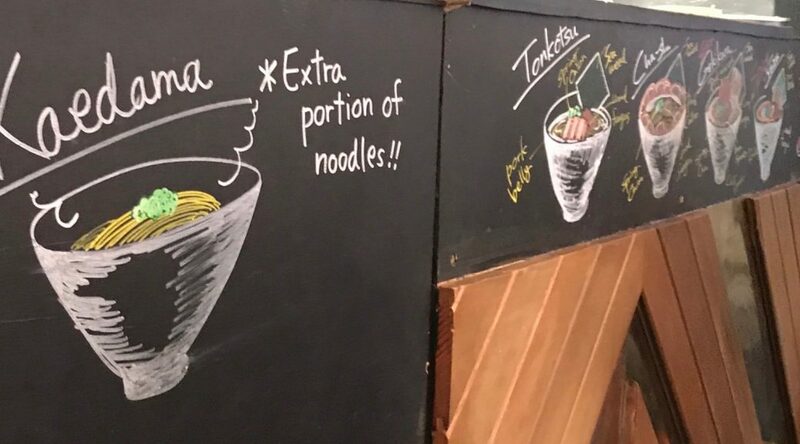 A great thing about some ramen joints is the ability to order extra noodles if you have excess soup. the second helping of noodles was firmer, which I preferred. The egg though. Let me tell you about the egg. The Tonkostu X doesn’t come with an egg as standard, but google pictures of ramen and there is invariably egg. I’m no purist, but there should always be an egg. This egg was perfection. I’m a bit sad that I didn’t try an onigiri rice ball. The lady seated next to me had one and it looked great. The overall bill came to just over £51, which I thought was pretty average value for London, and good considering it’s the first time we’ve had kaedama (the noodle refill). Overall I liked Kanada-Ya, but feel a little let down by my choices, which just means I’ll have to go back! On this occasion I’m rating a middle of the road RAMEN (3 out of 5), but really any points taken away (other than the stringy chicken) are my fault rather than theirs.